CASTING ALERT! NATIONWIDE! 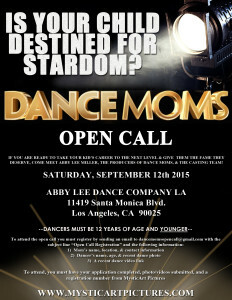 NOW CASTING YOUNG DANCERS FOR DANCE MOMS! Is Your Kid Destined for Stardom? 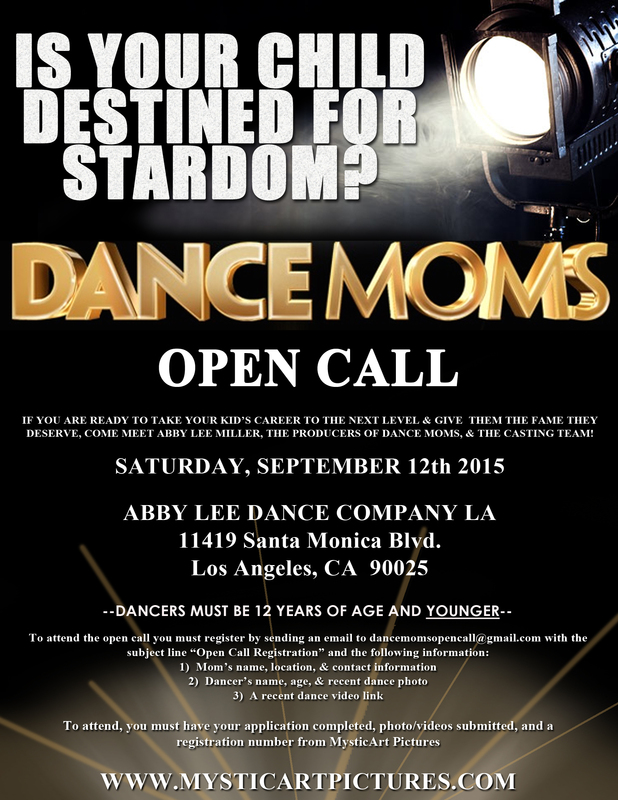 DANCE MOMS – OPEN CALL! If you are ready to take your child’s career to the next level and give them the fame they deserve, come meet Abby Lee Miller, the producers of “DANCE MOMS”, and the “DANCE MOMS” casting team! To attend, you must have your application completed, photo/videos submitted, and a registration number from MysticArt Pictures. MysticArt Pictures is uniquely positioned in the Entertainment Industry as one of the most innovative multi-faceted companies of its kind. The foundation of this award-winning company and the key to its success in both television and film is talent. From casting thousands of hours of both scripted and unscripted television shows for every major broadcast and cable network to producing television projects and critically acclaimed films, MysticArt has recognized its most valuable asset is talent. MysticArt has consistently created opportunities for creative minds to bring simple concepts to life. They infuse each project with innovative ideas and unforgettable talent. President and CEO Katy Wallin has a proven track record and has created unique business models and strategies to ensure all companies and collaborators are successful. BEWARE: It appears that the DanceMoms cast and crew have NOT complied with the laws in CA. They must pass a fingerprint check and get Child Performer Services Permits from the DLSE. This is crucial, since one of the most notorious child molesters in the dance world, Grant Davies, worked on this show! In many cases, Abby Lee would also have have to get a Krekorian bond, since she claims to be managing children and providing professional services for a fee. In other words, it appears they are operating illegally! Please check credentials before working on this show! And wouldn’t it be great if dozens of parents ASKED them about their legality at auditions?